Less than five months ago, Axioma (launched as Red Square) put Dunya Yachts on the radar of a spectrum of megayacht buyers. Why? Because that’s when the 236-foot (72-meter) megayacht, the first project for the Turkish shipyard and completed on spec, sold at the Monaco Yacht Show. Axioma was delivered to her buyer in October. Available for charter, via Yachting Partners International, Axioma is continuing to raise the profile of her builder. Several things make the steel-hulled yacht stand apart. Dunya Yachts wanted Axioma to be a head-turner, brought to life by experienced players. 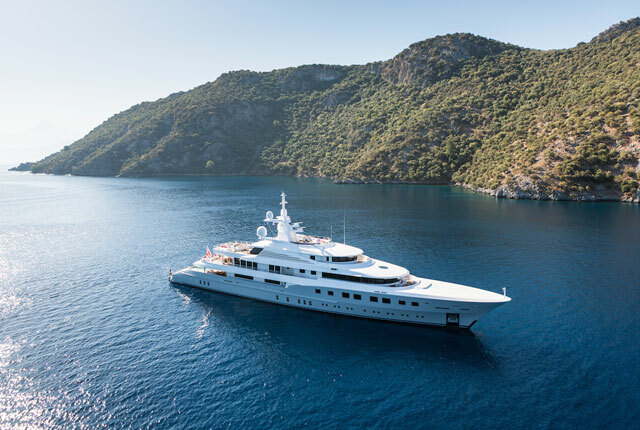 As Sedat Ergün, president of Tuzla-based Ursa Shipyard (where Dunya Yachts operates), puts it, “We worked with some of the most experienced brains and craftsmen in the business to create a world‐class vessel that will continue to be a showcase of what the Dunya Yachts brand can achieve.” Styling is by Sterling Scott, whose principal worked for notable names like Oceanfast, Feadship, and Jon Bannenberg before hanging her own shingle. Axioma bears striking interior design and arrangement by the late Alberto Pinto. One of the most impressive interior features, highlighted in the video here, is the atrium-like saloon. As remarkable as it is, it does not make Axioma look or feel cavernous, or overwhelming. Axioma also has an unusual general arrangement. All five guest staterooms are on the main deck, along with the master suite. The owner further gets a good deal of space on the upper deck. In addition, a spa and steam room aren’t below decks, as you’d expect. Rather, Axioma has them above decks. The lower-deck location that gets freed up is in turn occupied by the cinema. Throughout the entire interior, Pinto gave a sophisticated edge to the directive of a beach house feel. Of course, megayachts need attractive alfresco areas as well. Axioma does not disappoint in this regard. Be sure to note the glass-sided pool aft on the main deck and the sunning space on the sundeck.